The Disappearance of Eleanor Rigby: Her/Him (recommended): The two-movie version of this story, which originally opened a month ago, is a strong companion piece for those who were entranced and wanted to know more about its characters. Now playing in alternating order at the Paris Theatre. My full review will be up tomorrow. 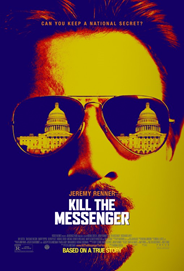 Kill the Messenger (recommended): Jeremy Renner is superb as a journalist set on seeing his story about CIA involvement in cocaine distribution in the United States through in this energizing and strong drama. Now playing at AMC Lincoln Square, AMC 34th St, and AMC Kips Bay. Read my review from yesterday. One Chance (recommended): James Corden is the true star of this charming film about a young man who just wanted to sing opera. The opera is great, but the story and the acting are too, which is a treat. Now playing at Village East Cinema. Read my review from Wednesday. Whiplash (recommended): Miles Teller and J.K. Simmons are both terrific in this hit from the Sundance Film Festival and the New York Film Festival as a determined drumming student and his tyrannical instructor, respectively. Now playing at City Cinemas 123, Lincoln Plaza, and Regal Union Square. Read my review from Sundance. Aftermath (recommended): This Polish drama about two Christian brothers pushing too hard to unearth the Jewish roots of their town was extremely controversial in its home country. A very compelling and thought-provoking subject matter takes shape in an involving drama and decent thriller. 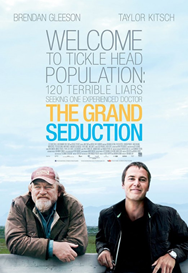 The Grand Seduction (highly recommended): This enormously enjoyable film features the odd couple of Brendan Gleeson and Taylor Kitsch as a motivated resident of a wilting harbor and the doctor he tries to lure there to help it thrive again. It's a delight from start to finish. Obvious Child (recommended): This comedy, which played at the Sundance Film Festival this year, is most notable for giving comedian Jenny Slate a lead role, playing a part perfect for her. The film around her isn’t always as strong, but she’s great and should have a bright and funny future. Tasting Menu (recommended): This food movie isn’t all about its appetizing dishes, but instead offers up a handful of fun and involving storylines that, for the most part, come together in a positive and enjoyable format. In a World… (recommended): Actress Lake Bell steps behind the camera for this fully entertaining cinematic realization of the profession of voiceover artists. It’s an enjoyable if inconsequential movie with some sincerely funny moments.